Engage more of your website customers by enabling them to see their exact credit score when visiting your website! 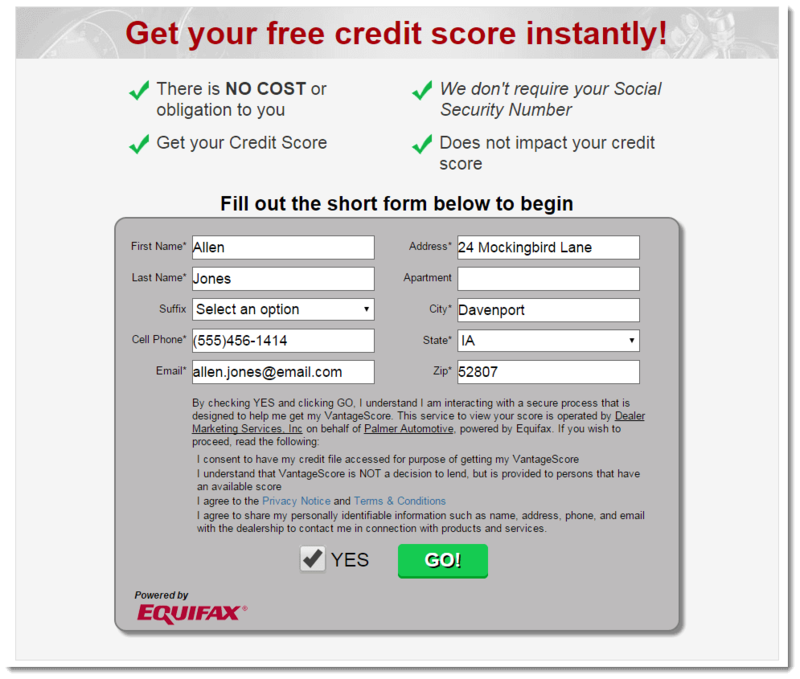 Instant Score is an effective credit soft pull tool powered by Equifax. Using soft pull technology, we can provide a plug-in ‘Call to Action’ form on any dealership’s website. It enables customers to easily see their exact credit score which gives them a reason to submit their information. Dealerships benefit by not only seeing an increase in leads, but also higher quality leads. Customers realize how important their credit score is when determining whether or not they will be approved for financing. They also realize their payment will be determined by the interest rate, which in turn will be determined by their credit score. Despite that, most people have no idea what their credit score is or how to find it. Your website can be a source of help and information for people looking to purchase a vehicle. Most lead sources provide the standard information: name, phone number, email, address, etc. Instant Score provides the contact information PLUS verifies the customer’s identity. No more wondering if the customer is a legitimate or bogus lead. After receiving their exact credit score, customers will have the ability to share it with the dealership. Dealerships will then receive their credit score within a 20-point range, giving them valuable information when working the lead. The quality of leads increase even further when this action is taken by the customer. Set your dealership apart from your competitors by giving customers what they want: an easier, quicker, and information-producing solution to purchasing a vehicle.